See snip below.... 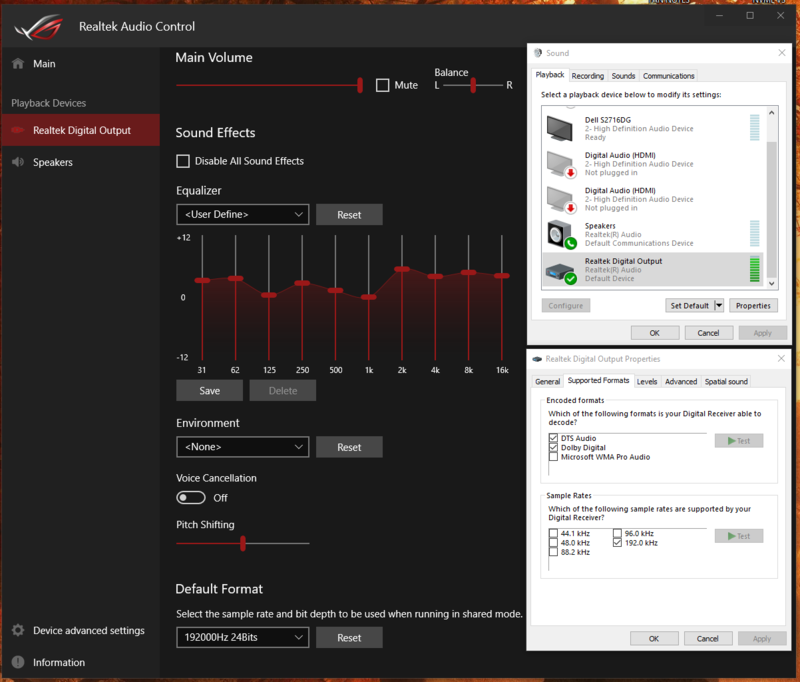 I'm curious about what settings I need when running spdif out of the computer into the modi. What sample/bit depth should I be selecting? It's a little confusing. Should I just be picking the maximum of both? Or should I also be selecting all of the checkboxes in windows preferences? Also, what exactly is "shared mode" referring to? I have FLAC files as well as stream from tidal (plus some games) if that makes a difference. The most obvious one is not to use this at all. Get yourself a media player supporting WASAPI or ASIO and “connect” to the audio device bypassing the Win audio stack. This allows for automatic sample rate switching. The Win re-sampling isn’t that good. Ok, if I go the USB route and try jriver (what are some others? ), how simple is it to frequently switch back and forth between my 5.1 speakers, connected to the onboard audio, and my headphone connection/dac? Is it just a matter of selecting "speakers" versus the program as my playback device, and thats it? So if I change over to using USB, then I will use WASAPI via my player (jriver or the musicbee one you suggested perhaps), UNLESS im doing stuff like playing games? Becauase it can only play one source at a time? Sorry for the trivial breakdown here. Every application has to have special code to use WASAPI (exclusive mode) or ASIO. If you don't see such references in its audio setup, then it is using standard windows audio pipeline. For that, you should set the sampling rate to 44.1 kHz and bit depth to 24 bits (or 32). The default is 48 khz which is not correct as most of the content is 44.1 kHz. So I ended up messing with the DAC and USB mode last night. can anyone give some input on if this sounds correct to get the highest quality audio?. I downloaded the trial version of jriver just to see what it was about. I selected my USB DAC/wasapi as the playback device option within jriver. I then went to Windows sound options and selected the jriver program as my playback device. now I can easily pick the playback device to be the speakers for my 5.1 OR jriver for my headphones. Does this seem correct? Also if streaming in tidal I have it set to play back to the jriver device in exclusive mode since it has that option. Anything I'm missing? You selected WASAPI(exclusive) as the "output" and your specific playback device (DAC not system default) as your "sound device" in jriver yes? If so then the windows default playback device is irrelevant when your listening to music. WASAPI(exclusive) bypasses the windows mixer. 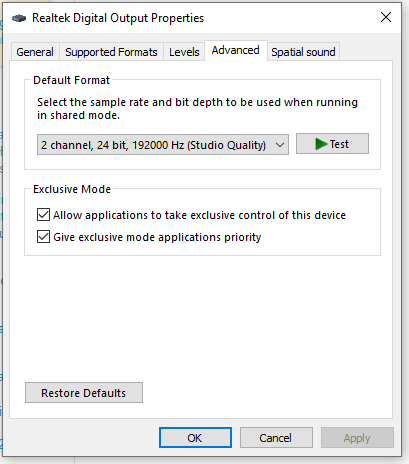 And the settings on that device are also irrelevant, the default format sample rate and bit depth only applied in shared mode not exclusive. As for the spatial sound I'm not sure, I think that counts as "sound effects" which are disabled in WASAPI(exclusive) mode. But I'm not so sure about that one. If anyone knows let me know! And same as Vincent I would recommend MusicBee. It's a great player, seems to work perfectly in exclusive mode. get Foobar2000 for all your music needs (free, open source). It can do WASAPI, ASIO, has tons of useful plugins. For movies - use latest VLC (free, opens source), it has WASAPI support. For games - u r stuck with Windows, it will still be pretty good. For youtube - smplayer Though with youtube you will get highly compressed audio so the value of WASAPI is not clear.